HIMOINSA manufactures and delivers power generation equipment worldwide. Products available include generator sets both diesel and gas, hybrid power gensets, lighting towers and paralleling systems. Heavy Range – HIMOINSA’s heavy range of diesel generators is available from 670kVA-3.000kVA. 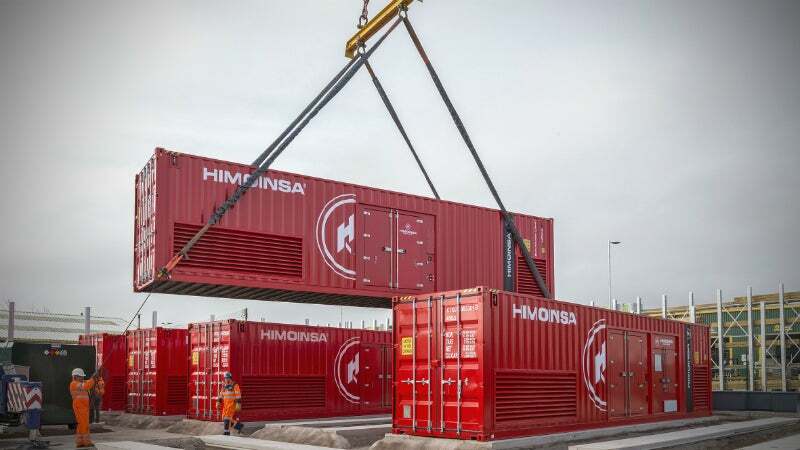 It also comes in various configurations including container versions of 20′ and 40′ HC that can be equipped with different synchronisation systems, open skid, and with soundproofed canopies. The company also offers a range of medium voltage generator sets such as protection and power switchgear products, synchronisers and power managers. HIMOINSA’s medium-voltage range is designed to provide customers with reliable and high-performing products, which can be issued with medium voltage transformers or output depending on the needs of the site. Industrial Range – In the industrial range (4kVA-800kVA) HIMOINSA offers a variety of prime movers and configurations. The low to mid range is durable in all conditions and can be used for peak shaving, continuous power supply, or on standby for residential, commercial and industrial sectors. Rental Range – HIMOINSA has recently introduced a rental range of generator sets. These sets are manufactured to withstand extreme environments including very high and low temperatures, ice, snow and rain while still maintaining a high-quality acoustic performance. HIMOINSA gas generator sets are available worldwide, and can be powered by LPG, biogas and natural gas. With a power output range of 8kW to 1,500kW the set offers low-noise levels and vibrations. They also provide lower maintenance costs and lower emissions than the diesel generator option. HIMOINSA incorporates a complete gas train into its equipment, with a manual shut off valve, gas filter, pressure regulator, double solenoid valve, low pressure switch and inlet / outlet manometers. The gas train has all required security certifications. This plug and play equipment guarantees a higher level of safety and helps to reduce installation costs and to simplify the installation room design. In addition, the use of proven technology for continuous power ensures the reliability and durability of the genset. HIMOINSA can design and customise products to meet client’s specifications on every project. The company offers commissioning and on-site training to ensure the maintenance of equipment. The company can offer turnkey projects in which it takes care of every stage of the project from design to construction and installation of equipment. The engineering team at HIMOINSA has also developed a plug and play product for IPP and power plant projects, providing customers with quick and easy deployment. HIMOINSA support the customer at every stage of the project offering experience, knowledge. It also ensures that all operation staff are well-trained in plant safety and operations maintaining high-performance levels. The company is a vertical manufacturer, this ensures it has complete control over the production process and increases efficiency. For use in the telecom sector, HIMOINSA has designed the HPS 1500DCV and HPS 3000DCV hybrid generator sets which can offer fuel consumption savings of 40% when compared to a standard generator set and 20% in comparison to sets with a set speed. The company also offers a varied range of lighting towers, which are small and hard-wearing. With a lighting capacity of up to 1,320,000 lumens, some of the towers in the APOLO range can light up an area of 110,000m² and have 166-hours autonomy, equivalent to 17 nights without being refuelled. The carefully thought out design includes LED versions that consume substantially less fuel and their small dimensions make them easier to transport, reducing the shipping costs. Covering an area of almost 40km², the Port of Constanta, in Romania, is the largest port in the Black Sea and is able to handle 100 million tons of cargo per year. The Data Center Continuous Power (DCC) application has experienced growing demand in the diesel generator set industry. The products and services HIMOINSA offer. The characteristics of the site in which an emergency generator set is to be installed as an alternative source of energy in the event of a main grid supply failure, determines to a great extent the choice of the switching system. Himoinsa will be providing power to six towers situated in a new hospital in the north of Ecuador. The company will do this through its delivery of 12 stand-by generator sets. HIMOINSA has released a new fleet manager device with C2Cloud technology, geolocation and anti-theft alerts. HIMOINSA has just released the 'Silent Plus' range, which reduces noise emissions without limiting the performance of the machine. HIMOINSA will showcase at Middle East Electricity 2017 in Dubai, February 14th to 16th, gensets and lighting towers designed to work in desert extreme conditions. HIMOINSA has signed an agreement with Matforce Mali to improve the delivery times in the country and enable the supply of spare parts and qualified technical assistance 24/7. The factory that HIMOINSA established in China in 2006 has brought together the whole distribution network in Asia-Pacific to celebrate its 10th anniversary in the country. Coinciding with the 20th anniversary of HIMOINSA's first exports to other European countries and with a view to analysing the trends for the coming years, the company has invited its entire continental network of distributors to its headquarters in Spain. HIMOINSA enables 500 researchers to work at the University of Murcia's Biomedical Research Laboratory (LAIB) with two gas generator sets. The units supply energy for the construction of the Basilica. HIMOINSA supplied a redundant emergency power supply for one of the world's most advanced surgical centres. The 'OTRAC MANEUVER D4YS' event, that took place in the city of Sharm el-Sheikh, on the Red Sea coast, attracted more than 200 visitors, including representatives of other Egyptian bodies such as the National Organisation for Potable Water or the National Electricity Company. In the United Kingdom, various areas register well above normal levels of electricity consumption at certain peak times during the day. HIMOINSA offers generator sets with more autonomy, reduced refueling frequency and longer maintenance intervals. The range of diesel generators for the rental market is now bolstered by the HIMOINSA models HRGP 25 T5 LPG, HRGP 40 T5 LPG and HRGP 60 T5 LPG. HIMOINSA FAR EAST PTE. LTD.
Calle 2, Nº 72. Sector: El Millon. Distrito Nacional.